Our mission is to acquire and preserve a regional greenbelt of open space in perpetuity; protect and restore the natural environment; and provide opportunities for ecologically sensitive public enjoyment and education. 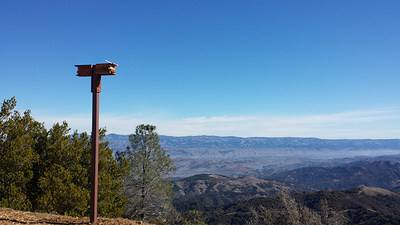 February 2014 - Demolition is complete at Mount Umunhum. 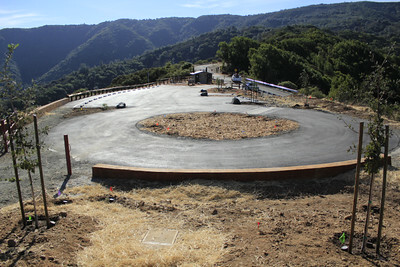 All of the structures at the former Almaden Air Force Station on Mount Umunhum (except the radar tower) have been demolished, utilities and asphalt paving were removed, and 95% of the building materials were recycled. 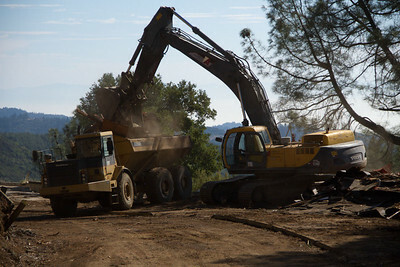 As a part of the demolition work, slopes were re-contoured as much as possible to match the original ridges and swales that existed prior to construction of the Almaden Air Force Station. Erosion control measures were installed, and the site held up well during the latest rain events. The new Bald Mountain Parking Area is now open to the public. 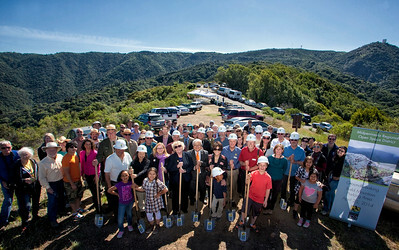 District Board Members, Staff and Partners gathered together for the Groundbreaking for the Bald Mountain Parking Area on April 23, 2014. 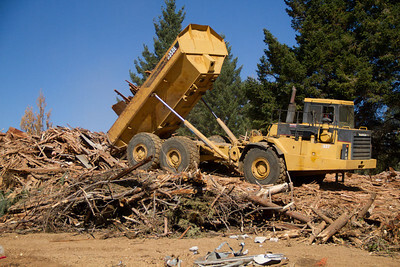 Piles of wood, metal, and concrete, are sorted and ready for recycling. 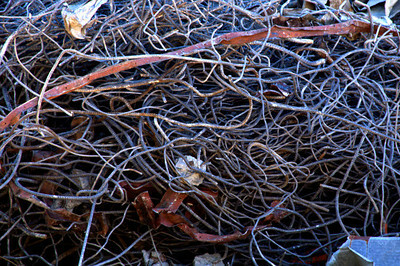 Piles of twisted rebar, ready for recycling. 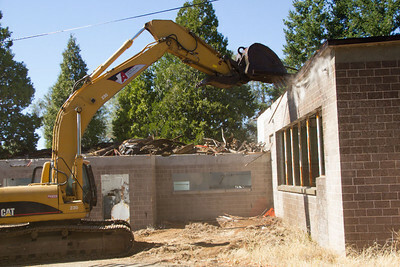 Excavators are the tool of choice for this type of demolition at Mount Umunhum. 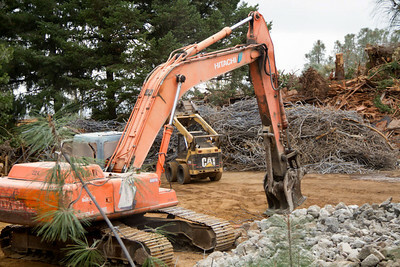 An excavator works in tandem with a crewmember to sort building materials in preparation for recycling. 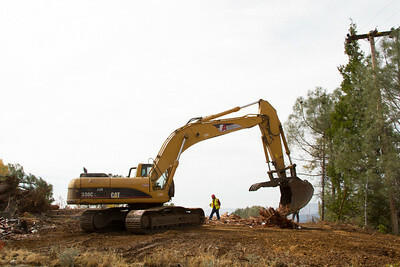 Clean wood from demolished buildings will be ground into mulch and will remain onsite for erosion control. Large six-wheeled articulated dump trucks are used to move building materials around the site. 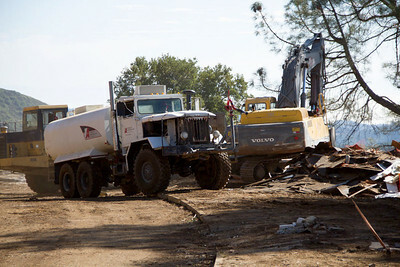 One of the key tools on site is the water truck. Two water trucks are available to help keep dust to a minimum to provide for the health and safety of demolition workers and public. Staff reviews the demolition progress, looking out over the site towards Santa Cruz.